I, for some reason, never seen the episodes that covered this omnibus when I was a kid and it was airing on TV. So reading this was a good treat, especially with a couple of the characters that show up are either mentioned or reappear in later arcs. 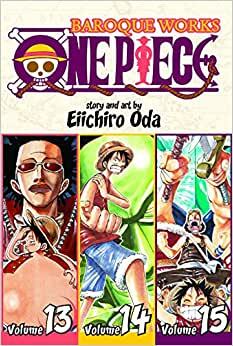 Nami's compass leads the Straw Hat crew to a place called Little Garden, an ironic name when you learn what type of creatures and the two local residents. The crew splits up as they explore and they meet up and fight Baroque Work members and the leader of the organization is reveal (who happens to be one of my favorite One Piece villains). Exactly as described. This is what the fifth book I’ve ordered to continue my set. Elbaf! Or as twin peak's demons would call it "Fable". More of that foreshadowing and part of the whole Ussop's tales coming true. This is really where the long arcs start coming into focus and the 1/1 2/2 fights progress into pretty lengthy chapters. Oda seems to have gotten into his writing groove here when he was putting all together.